The other day I published a video on LinkedIn that attracted some attention and sympathy (watch it here). The title is "Do you ever feel like standing in the rain?" It's about a myth I keep encountering, namely that success means a better and easier life. Is that really the case? The answer: Yes, partly. After all, success comes at a price (which everyone who wants to be successful in an unfamiliar field knows): The price is that you have to do profane and often hard work which has nothing to do with success directly. As a top tennis player, you have to train serving again and again, even if it's not fun (and it almost never is). As a top seller, you have to generate new leads again and again, even if it's hard and ungrateful. And you rarely feel successful. As a top leader, you always have to deal with the profane worries of the team members and other unpleasant topics, even if you would rather do completely different things. There are countless examples of these. 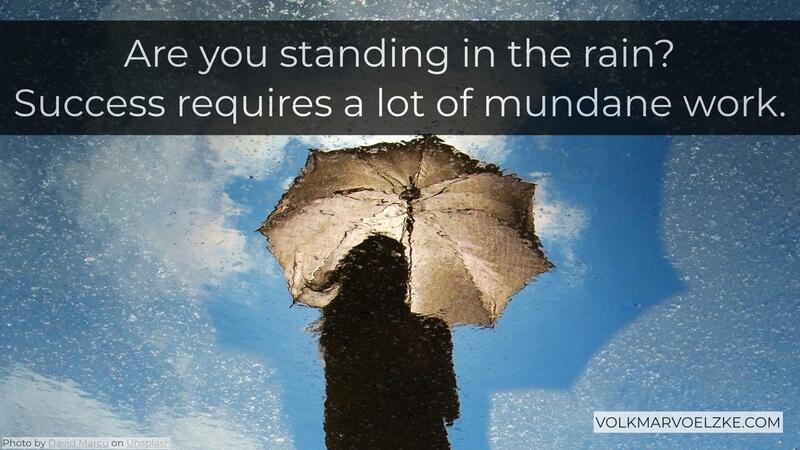 The hard truth: the particularly successful stand much more often in the rain than in the sun. But I tell you: these sunbeams are simply incredibly beautiful. That's why we do it.